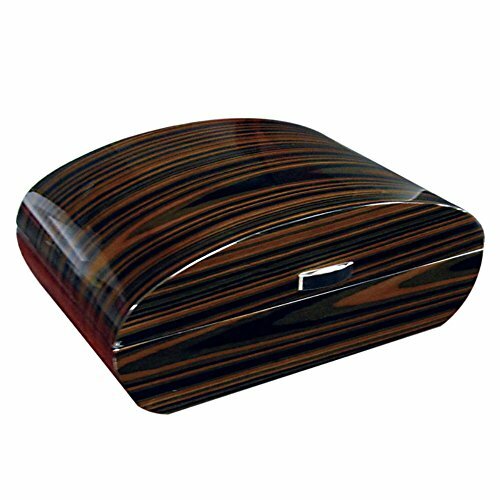 The Prestige Import Group Waldorf Humidor is an exotic beauty sure to dress even the most well-appointed bar. It features a unique arc shape, dramatic wood grain, and a two-tone high-gloss finish that gets noticed. It's Spanish cedar lining and three adjustable dividers make it a perfect way to house 150 cigars. The polished silver humidifier, hygrometer, and cigar scissors are magnetic and attach to its invisible steel lining inside the lid. Holds and protects up to 150 cigars. Made of wood with Spanish cedar lining. High-gloss finish, arc top, and silver pull. 3 adjustable dividers, invisible steel lining under lid. Polished silver and magnetic humidifier and hygrometer. Dimensions: 16.75W x 10.75D x 6.75H in..
View More In Tobacco-Related Products. If you have any questions about this product by Prestige Import Group, contact us by completing and submitting the form below. If you are looking for a specif part number, please include it with your message. Cone Filling System – Fill 300 Pre-Rolled Cones in 1 Hour! Easily Produce High Quality, Evenly Packed, Custom Sized Cones. Designed for Raw 1 1/4 Cones.